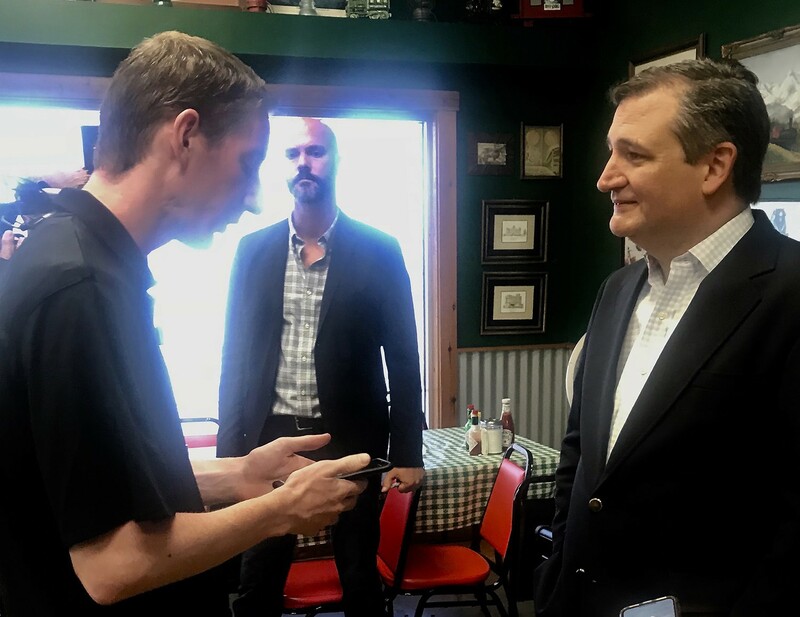 U.S. Sen. Ted Cruz (R-TX) appeared at Cafe Chris in Pleasanton with Republican State Senate candidate Pete Flores, who is a Pleasanton resident and was the front finisher in the District 19 Republican primary. After being introduced by Flores, Cruz spoke for an hour in front of the packed restaurant. Sen. Cruz, who is running a close reelection race against U.S. Repressentative Beto O’Rourke (D-Texas 16), spoke on many issues. He spoke of the strong Texas economy, cutting regulations and the historically low Latino unemployment rate nationwide. “When you have low taxes and low regulations, Texas does phenomenally,” he said. “I think amnesty is wrong,” he said. Sen. Cruz used the term “executive amnesty” to describe the Deferred Action Childhood Arrivals (DACA), the program enacted by President Barack Obama by executive order that allows young undocumented immigrants to stay and is currently being considered by courts after President Donald Trump attempted to end it. “It was targeted to those who came as kids. It created more and more incentive for kids to come,” he said. He also answered questions from media. Sen. Cruz, who has tried throughout his tenure to repeal the Affordable Care Act, expressed his proposals for replacing it. He said a replacement would have “more choices, more competition and more options.” He also supports keeping protections for people with preexisting conditions. “I think there is widespread bipartisan agreement that people with preexisting conditions should have coverage. I think the way to do that is have high-risk pools that are directly receiving funding,” he said. He discussed the importance of VISA enforcement. Sen. Cruz said that immigration fraud, which has become scrutinized by the U.S. Citizenship and Immigration Services, is a significant concern.